When chipped rice had been served to everyone, Lord Nityananda Prabhu, in meditation, brought Sri Caitanya Mahaprabhu. 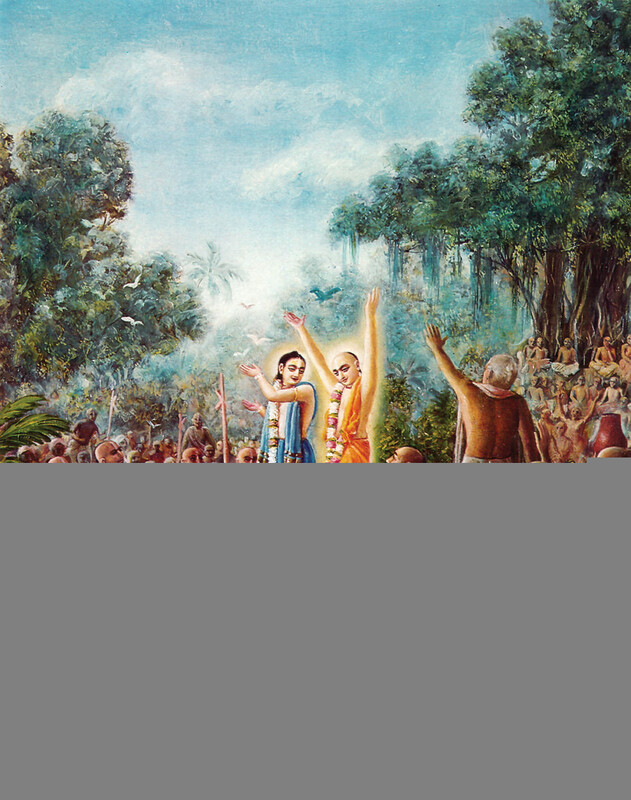 When Sri Caitanya Mahaprabhu arrived, Lord Nityananda Prabhu stood up. They then saw how the others were enjoying the chipped rice with yogurt and condensed milk. From each and every pot, Lord Nityananda Prabhu took one morsel of chipped rice and pushed it into the mouth of Sri Caitanya Mahaprabhu as a joke. Sri Caitanya Mahaprabhu, also smiling, took a morsel of food, pushed it into the mouth of Nityananda and laughed as he made Lord Nityananda eat it. In this way Lord Nityananda was walking through all the groups of eaters, and all the Vaisnavas standing there were seeing the fun. No one could understand what Nityananda Prabhu was doing as He walked about. Some, however, who were very fortunate, could see that Lord Sri Caitanya Mahaprabhu was also present. Seeing Lord Caitanya Mahaprabhu eating with Him, Lord Nityananda Prabhu became very happy and exhibited varieties of ecstatic love. Lord Nityananda Prabhu ordered, ‘All of you eat, chanting the holy name of Hari!’ Immediately the holy names ‘Hari, Hari’ resounded, filling the entire universe.